Game fishing is the term used to describe fishing in freshwater for salmon and trout. The bait used to catch these species of fish fall into two categories: natural bait and artificial bait. For many generations of anglers, worms have been the traditional bait for catching game fish. The lobworm, found under stones or dug from soil, can be used as single bait on the hook. Alternatively, redworms, which can be found in compost heaps, can be placed on the hook in a bundle of two or three. For tempting salmon, the use of two or more large lobworms can prove very effective. Many anglers use maggots to catch game fish. Maggots are dyed different colours, stay on the hook well and are readily available from tackle shops. If kept for more than three or four days the maggot will form a hard casing. This is the chrysalis stage of the maggot's development and is known by anglers as "casters". There are occasions when casters are utterly irresistible to trout and they will refuse any other bait! Artificial bait is designed to resemble food that would be present in rivers, streams, lakes and reservoirs. Wet flies are hooks made to imitate insects and tiny creatures that are found on the surface of the water. The hooks have been wrapped with bright threads and incorporate small pieces of feather. They are called wet fly because they are designed to slowly sink below the surface. There are many different designs or patterns of wet fly. They look attractive and most have intriguing names. Try a fly called March Brown for river fishing and Zulu is one to try on stillwaters. Dry flies imitate the natural insect diet of game fish. They are treated with water repellent materials and are constructed to float on the surface. Greenwell's Glory is a recommended dry fly for rivers and streams. A popular fly for lakes and reservoirs is Claret Hopper. 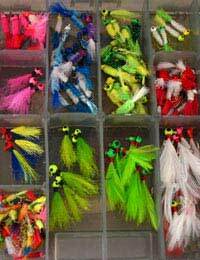 Experienced anglers take many different flies and are able to match up the fly they see on the day with the artificial fly they have bought or made. A spinner is artificial bait made to represent a small fish. As the spinner is retrieved through the water it rotates and vibrates imitating the movement of an injured or vulnerable animal, which in turn, attracts the predatory nature of salmon and trout. The spinner called Devon Minnow has the shape of a fish and is popular among salmon anglers. For small rivers and clear waters try a Mepps spinner. It shines and glistens and is often snapped up by trout through sheer curiosity. Mepps come in different sizes with the larger variety being used for salmon fishing. Sometimes, in large lakes and reservoirs, trout may have abandoned feeding near the surface and are hunting in deeper waters and this is when lures can be the best option for catching fish. Lures are designed to represent fish or even small mammals. They are able to sink further down and when retrieved will make a realistic darting and diving movement. There are some lures that have built in rattles! For salmon fishing try a lure called Husky Jerk.